Picture this: You've brought your sick child to the doctor's office. After checking her pulse and blood pressure, he takes a nasal or throat swab and inserts it into a mysterious black box. Before the doctor finishes his examination, the black box beeps, indicating that the pathogen that's making your child sick has been identified. Sound far-fetched? Actually, this scenario is closer to becoming a reality. 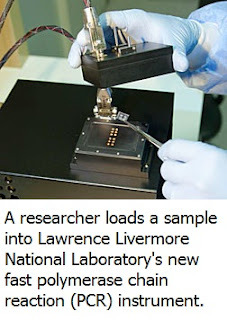 Thanks to work by Reginald Beer and his team of scientists and engineers at DOE's Lawrence Livermore National Laboratory, sub-three-minute amplification of nucleic acids (DNA and RNA) via polymerase chain reaction (PCR) is now possible. With three school-age children of his own, Beer knows all too well the frustration of waiting 24 to 48 hours for lab results to learn whether his sick youngster can be treated with antibiotics. "I was sitting in the pediatrician's office with my daughter several years ago, and it struck me that if we could make PCR fast and easy enough for use in doctors' offices, it would have a huge impact." PCR is an indispensible technique in medical and biological research laboratories around the world. It allows researchers and clinicians to produce millions of copies from a single piece of DNA or RNA for use in genome sequencing, gene analysis, inheritable disease diagnosis, paternity testing, forensic identification, and the detection of infectious diseases. The standard approach to PCR typically takes about an hour, which is a vast improvement over pre-PCR techniques that required days. However, PCR for point-of-care, emergency-response or widespread monitoring applications needs to be faster still—on the order of a few minutes. Beer set out to find out just how fast PCR could go. His goal was to develop a device where the limiting factor would be enzyme kinetics or thermodynamics, not mechanical considerations. He also wanted to use "volumes that are easy to interact with," not microfluidic-scale, knowing that in a diagnostic setting multiple analyses are often needed and the ability to load samples by hand is vital. As described in a recently published paper in the journal Analyst, Beer and his colleagues created such a device and demonstrated PCR times of less than three minutes. Their work was funded by the Defense Advanced Research Projects Agency and internal LLNL money. The device achieves its extremely fast thermal cycling through the use of a porous material and a thin-film resistive heater, making possible heating and cooling rates of 45 degrees Celsius per second, for a thermal cycle speed of less than 2.5 seconds. "This device is unique in that it cools as fast as it heats," noted Beer. With the device in hand, Beer's next challenge was to see if any commercially available polymerase enzymes could work rapidly enough. Out of a group of 10 polymerases advertised by their manufacturers to be compatible with fast thermal cycling, two enzymes worked in the LLNL device right out of the box. "We were really encouraged by the fact that two off-the-shelf enzymes worked at these speeds," said Beer, "and there are a lot of parameters that can be adjusted to potentially go even faster." The researchers demonstrated their PCR device by amplifying genomic DNA from an Enterobacter bacterium and a portion of SARS DNA. The first tested the device's ability to rapidly amplify a large DNA segment, and the second showed the device's utility in handling a public health threat virus. The device achieved 30-cycle (billion-fold) PCR amplification of the target DNA in as little as two minutes and 18 seconds. "When I set out to do this, people said it would never work," Beer recounted. "They gave mechanical reasons or enzyme kinetic reasons. But I answered, 'nobody really knows.' "
Now that Beer and his team have demonstrated sub-three-minute PCR, they are working to develop a real-time-detection device. They envision a PCR instrument that can complete a test, from sample to results, in five to 10 minutes. The market for such a device would be huge. In addition to the traditional public health and medical research applications, an easy-to-use real-time PCR device would be enormously useful in the livestock, poultry, agricultural and processed food industries for ensuring food safety. "We have a lot of ideas for solving the scientific and technical challenges unique to these applications," said Beer. "But this next step would benefit from finding the right commercial partner. We're very good at inventing technologies, but we need commercial partners to bring our innovations to market."